I woke early to the sound of birds, lots of them, and drew the curtains to reveal a never-ending view of coconut palms and a distant volcano rising out of the mist. I couldn’t have ordered a better view. There is something about coconut trees: exceedingly graceful and tranquil, their fringed leaves and slender carved trunks so beautifully crafted and effortlessly elegant. The volcano beyond was sheer poetry. Grand Luley Resort and Dive is a seven-acre property that has its own jetty and small private beach. A mangrove forest hugs the water’s edge. I take a stroll along the pier and breathe in fresh, pristine North Sulawesi air. I take a stroll along the pier and breathe in fresh, pristine North Sulawesi air. The sea is fifty shades of turquoise. Holidays should be like this! But who’s on holiday? I’m here to sample the food of the Minahasa, starting with breakfast. 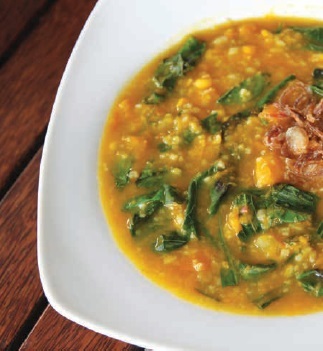 I choose bubur tinotuan, Manado-style rice porridge, a luscious mix of pumpkin, corn, green amaranth and rice. Soft, supremely nutritious and easy to digest. I’m crazy about bubur and, even more so, about pumpkin, and this Manado speciality was an intriguing new taste sensation for me. After a boat cruise around the islands observing exquisite coral and ocean life in a glass-bottom boat, it was back to the hotel for lunch. I dived into woku cumi-cumi (pardon the pun! ): tender pieces of squid braised in a woku spice paste of turmeric, ginger, lemongrass and tomato. It is similar to fish dishes I have eaten in Bali, delicately sweet and sour with the spices complementing, not overpowering, the fish. 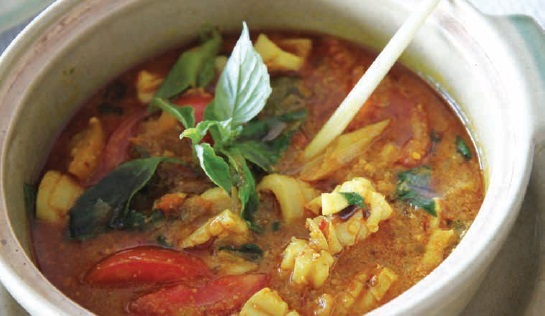 Manado-style fish soup was served alongside: white mujair fish simmered in a clear broth of tomato, lemongrass, lemon basil and a hint of lime juice, all served with the famous sambal roa, an über-hot chilli seasoning cooked with roa fish. Klaper tart followed, a creamy custard tart with a baked coconut crust – supremely delicious. Time to move on and we head for the hills, past the enormous flying statue of Jesus called Yesus Memberkati (Jesus Blessing) and into a Garden of Eden. Manado is resplendent with picture-perfect volcanoes, lush vegetation, cornfields, rice fields, sugarcane plantations and lakes. We stop at Gardenia Country Inn in the highlands of Tomohon, North Sulawesi, and step into a floral wonderland that would make Monet green with envy. Apart from comfy rooms, this cosy guesthouse has a Javanese-style teak restaurant serving local specialities and set in a breathtaking estate complete with lily ponds. We order red bean and beef broth simmered in freshly picked herbs and aromatic leaves. Perfect for the cooler mountain air. Lunch by Lake Tondano was perhaps the highlight of the trip and included grilled mujair fish, wok-fried kangkung, papaya flowers with fiddleheads, fat corn fritters, fish fritters, fish soup and a trio of sambals including sambal roa and dabu-dabu, which was devoured while soaking in the magnificence of this enormous lake. Next stop for afternoon tea was Lake Linow, Manado’s misty, jade-green sulphur lake, with a distinctive sulphur aroma. We munched on deep-fried banana, as thin as potato crisps, with sambal roa, while enjoying the tranquil sounds of nature. Simple and satisfying. Day Three and in Manado City. Yellow rice for breakfast at Pondok Indah in Kampung Kodo. This small eatery has all the bearings of a well-established café and the décor is a curios Alpine-cabin mix resplendent with plastic vines growing across the rafters, simulated tree trunk decorations and curly twig effects for window frames. I sit near a trio of Soekarno photos, enjoying the nostalgia of this quaint restaurant. 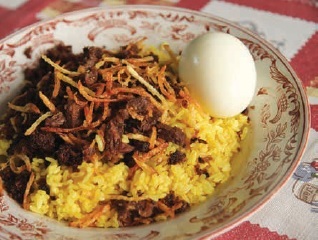 The yellow rice is similar to Javanese style but is served with ground abon fish, whole boiled egg, crisp potato slivers instead of shallots, and a firebrand sambal. The wet market is next on the agenda and this is where I always get excited. I choose not to look in the slightly dubious ‘meat’ section and instead hover around the fresh fish. The Minahasa are famous for eating just about everything that walks or flies so I decide to leave it at that. I stumble on a busy food stall amidst the vegetable sellers that serves, amongst others, barbecued fish cooked over an open flame. Papaya flowers once again (I’m in love with them), a dreamy, star anise-scented fish curry, spicy eggplant and the ubiquitous ayam rica-rica. 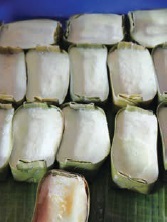 Rica-rica actually describes the hot rica chilli that is said to have been brought to Manado by the Spanish. And spicy is what this dish is all about. Wok-fried chicken is cooked in a hot chilli-tomato sauce that I can only call a sinus-cleansing experience. For a twilight seaside eat-all-you-can fresh seafood experience, Kalasey beach, just south of Manado, is where it’s all happening. For a twilight seaside eat-all-you-can fresh seafood experience, Kalasey beach, just south of Manado, is where it’s all happening. Typical of Indonesia’s coastal warungs, you can eat a range of seafood with loads of dabu-dabu sambal while overlooking the ocean and that majestic volcano, washed down with a cool drink. If you are looking for a cup of freshly brewed local coffee, head for Jalan Roda, known as Jarod, in the centre of town and step into a crowded bazaar of coffee stalls teeming, in fact absolutely pulsating, with the throb and hum of people from all walks of life chatting, drinking and, wait for it, playing chess. I’ve never seen anything like it! Table upon table, stretching the length and breadth of this long tin-roofed alley, full of men drinking coffee, smoking and thinking about their next moves. And, of course, where you have coffee you have snacks and street food. I’m blown away by another version of squid woku, stained glossy black by the addition of black squid ink, and a gentle eggplant lemongrass-coloured curry full of fresh lemon basil. And the friendly atmosphere adds to the experience. As I always say, apart from the flavours and sights, it’s the people of Indonesia who make it so special. For something sweet, we visited Evie Cake and Bakery at Pasar Kanaka for freshly made cakes of every description. I tasted lumpia basah – a freshly made spring roll am-packed with Asian slaw and crushed peanuts in a paper-thin wrapper made from coconut milk and flour; lampu-lampu-pandan – coconut dreamy, creamy custard set in banana leaves; nasi jahe – sticky rice with a hint of ginger; and gabin fla – custard-filled deep-fried crackers that remind me of a dessert my mum used to make.